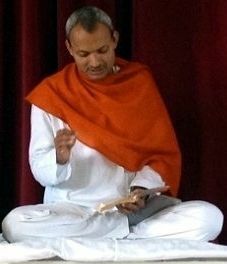 A. L. V. Kumar has been a lifelong practitioner of yoga and meditation. His interest in teaching came about after a car crash that resulted in complete paralysis of the lower body. He used his knowledge of yoga to restore his body to full health. Following this experience he decided to dedicate as much time as possible to teaching yoga to heal both body and mind. Since then he has taught yoga to over 13,000 people in India by conducting free public workshops, in addition to residential meditation courses, teacher training and yoga therapy courses in India, the US, UK and China. Kumar was recently honored with the Bharat Jyoti Award, The International Achievers Award and the Glory of India Award for his meritorious public service in the field of yoga. 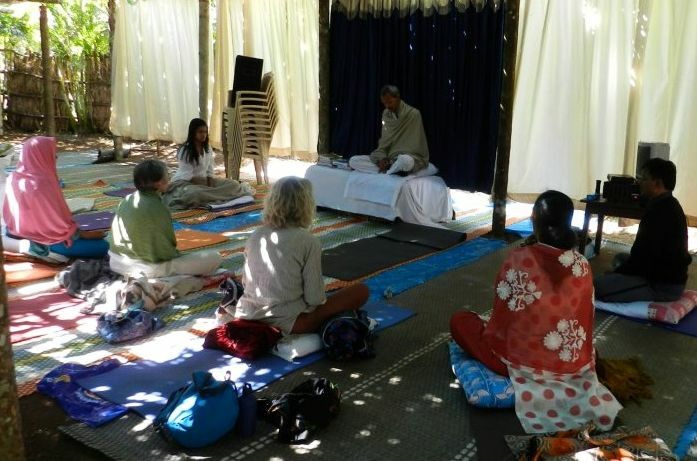 Anna Bhushan is a volunteer with The Yoga Healing Foundation, a charity under which Traditional Yoga programmes are run in collaboration with Traditional Yoga India. She is a trained yoga and meditation teacher, as well as a painter and lecturer. She has been studying with A. L. V. Kumar for many years and writes articles based on her conversations and recordings with A. L. V. Kumar. Devotion to the teacher, ‘the guru’, is often considered to be one of the most important steps in the spiritual journey. Traditionally in India, knowledge has been passed orally and experientially from teacher to disciple. The guru, having achieved complete purification of the mind, guides the student on the path of enlightenment to reach that same perfection. In Patanjali’s Yoga Sutras, the guru is the ‘Lord’ to whom one must surrender, ‘Eeshwara Pranidhanaha’ in order to know the path. In today’s world where thousands of gurus compete in popularity, how can we know when it is appropriate to ‘surrender’? And to who? How much and for how long? Is it right to have such devotion that we never leave our guru come what may? Devotion to a teacher should be to the qualities of that teacher (rather than to his or her physical form) and if we are not developing those qualities ourselves then something is wrong either with our ability as students or with the teaching itself. For example, we love and revere our teacher because of the pure unconditional love and compassion that he/she shares with all beings. We keep a photo of that guru and light an incense stick every day, we pray and worship at their feet, but if after years and years of following that teacher we are unable to feel the same level of love and compassion at least towards those around us, then that devotion has not served its purpose. Over time the teacher should be able to guide us to the same level he or she has reached. For this to happen, we as students should be wise enough to understand the teachings properly and to practice right devotion, not blind devotion. We need to grow in spirituality not merely grow old in spirituality. 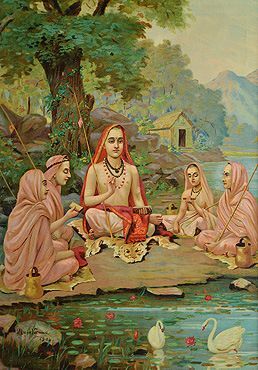 Adi Shankaracharya writes in great detail about the qualities a student must possess in order to be worthy of a teacher and likewise, the stringent criteria a student should use in verifying the teacher before becoming their devoted pupil. A teacher should have conquered and removed all the unwholesome qualities of the mind (such as anger, jealousy, lust, greed, craving for name and fame) and achieved the peace and purity of enlightenment. A teacher should not only have attained that level but should have the time, interest and ability to personally guide the student. Yoga is a science and at every step should be practiced with common sense and not be clouded by emotion. Blind attachment to a guru who is not able to help one really progress can be a major stumbling block on the spiritual path. So, the first step is to verify the teacher’s level of purity, experience and ability to teach the path (this is not equivalent to their level of fame and popularity). The second step, once we become their student, is to assess whether we are developing under the guidance of the teacher. Yoga is a science. If we understand this science properly we can understand the techniques being taught by the teacher and know to what level they can take us. We can make an informed decision about which teacher to follow by understanding the path they offer. Many teachers offer the basic foundation steps in the path of yoga, known as conditioning yoga (pravritthi yoga), a few may offer the advanced or highest levels in spirituality, deconditioning yoga (nivritthi yoga). For instance a mantra is very helpful to transcend the mind at the beginning, however a mantra can never take one beyond the second level of Samadhi, let alone to enlightenment. The problem comes when we attach ourselves to a guru teaching at the basic level and think that they can lead us to the highest enlightenment. We won’t leave them come what may. It’s the equivalent of attaching ourselves so much to our primary school teacher that we refuse to move up to junior and then secondary school. The path of right devotion would teach us to value and respect our primary school teacher. When we have learnt whatever there is to learn at that level then we move on to secondary school and we become completely engaged with the new teaching. We are building on the earlier progress that we made, and this does not mean that we are ungrateful or disloyal to our primary school teacher. We have not betrayed our primary school teacher. It is natural that we should seek to learn more and more. And when we graduate with a PhD we feel grateful to all our teachers from primary level through to post graduate level. The advice is to stick with a guru for 12 years maximum. If in that time you have not made good progress and at least reached the first stage of enlightenment then it’s appropriate to move on and keep seeking a teacher who can take you further. A boat (like a tradition or technique) helps us to cross a river. We feel gratitude to the boat but that does not mean we carry it on our backs forever. We have to be wise and pragmatic on the path of yoga. If we are fortunate enough to come across a truly enlightened teacher who is able to teach the path, and if we are experiencing that level of progress then we should absolutely stick with that guru. There is no need to look any further. Very useful article and Thanks .